The Limited Ed. is here! The long awaited Mouse Guard Fall 1152 Black and White hardcover is in stores now! It is a beautifully printed and packaged 12" x 12" slipcased fabric-bound edition of Fall 1152. The goal of this book was to replicate the feeling of having all the original artwork for the series in your hands. 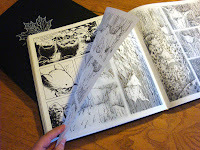 So the pages are printed in their inked-form, at original size and the pages with rain got a vellum overlay. I'm very happy with the result. The printing was limited to 1,000, but I am told they are still available at Diamond, so ask your local comic shop (LCS) to order one for you if you are interested. I was talking with a few creators I know who have books in Previews currently and they were anxious over methods that, as a creator, you can maximize orders in the narrow window that an individual issue of a book is solicited for. Some of them have come up with a 'coupon' which is a printable graphic that promotes the book and has the Diamond order code with a space for your name and contact info. The idea being that potential fans would print this and then go to their LCS making it easy to place an order. While I don't see this marketing method as a waste of time (the effort on the creators part is minimal, so any results from it are worthwhile), I questioned how effective it really could be. 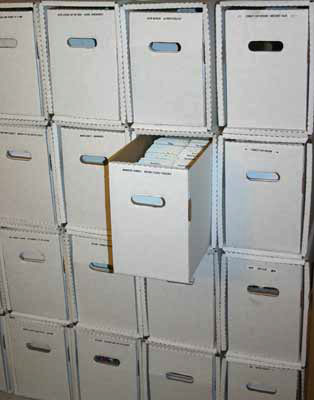 It made me wonder how many comic fans 'order' their books. I'm sure there is a core fanbase that has a pull-list and or scours previews each month for what they want, but I am guessing that the majority of comic buyers go to their store, and shop based on what is on the shelves. This means that they are relying on the shop owners to narrow down the selection in previews for them and to not overlook any item they may be interested in. I have only recently started 'pre-ordering' comics. The store I went to as a kid only offered a 'subscription' service as a member of their club, ie: $20 per year. Now $20 annually wouldn't break me now, but as a kid I did the quick math and figured out that I wouldn't order enough books to make it worth while. Some stores ask for a deposit for a pull list, others ask for a deposit based on what you order each month. I bring this all up, not to complain or offer a solution, but to take notice that there are books being offered that are in danger of falling below Diamond's minimum that you readers may not even know about because they shop based on what their LCS ordered. I'm not suggesting that every comic buyer buy an issue of Previews or for shop owners to change their policies, I just saw a massive disconnect between creators/publishers who are marketing to readers who may not even know how or know the option is there to order books. I am really happy to be doing these covers for Boom. I have gotten the go-ahead that I'm getting to continue some of the Muppet covers after Muppet Robin Hood!! Who said that every wish won't be heard and answered, when wished on the morning star?